In the egg processing and packing station Hock Soon needs reliable packers that can guarantee the quality of its products and ensure speed of processing. This is important as Hock Soon sends out their eggs to the market on the same day it is collected at the farm. Eggs arrive from farm houses on conveyor belts and into the packing station fitted with two Moba machines. The newer machine is the self cleaning Foodtec machine which can process 120,000 eggs/hour. These fully automated high capacity egg grading machines sanitise, grade and sort the eggs. The Hock Soon brand of eggs is sold at leading retail outlets. The farm is also an OEM manufacturer of eggs for hypermarkets and big egg dealers. The farm is accredited with Malaysia’s Good Animal Husbandry Practitioner, the halal stamp and the Health Ministry’s Mesti certificate for quality and safe food. 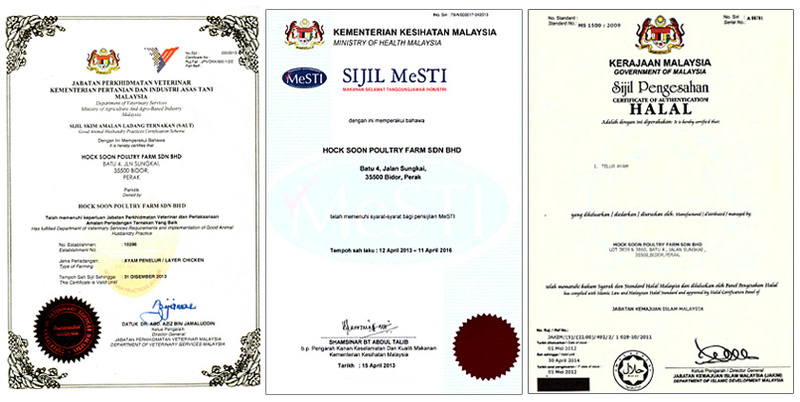 Hock Soon is in the midst of applying for the HACCP certification. The management feels that with the system in place consumers will be more confident when purchasing their product.